Have you ever said “There’s got to be more to life than this”? Well, there is and this unique book holds the answer. It’s for anybody who dreams of a life lived with greater purpose, success and fulfilment and is a time-honoured way for you to realise your deepest potential and experience true freedom by finding and being yourself. The powerful programme revealed in this amazing book has already helped millions of people around the world. Give it 100% and you’ll discover a far-reaching, life-enhancing experience that will go beyond anything you’ve ever experienced. 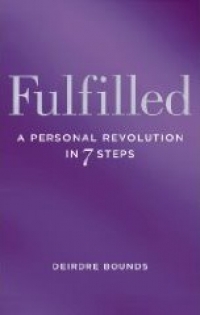 Derived from the highly-regarded and world-renowned 12-step programme, this remarkable book will take you on an exciting journey towards life-long, personal fulfilment. *Discover what is really holding you back so you can at last be free to move your life forward. *Realise a previously lost, unsuspected and untapped power inside of yourself. *Uncover and discard the debilitating effects of guilt and fear. *Free yourself from your past to enable you to unlock the full potential of your future. *Evict the the people who are cluttering your mind and living rent-free in your head. *Learn how to make difficult relationships work. *Find out who you really are, what makes you tick and work out your unique place in the world. Written in a refreshingly honest, entertaining and personable style, Fulfilled is a tried and tested formula for understanding what we are to ourselves and to others; for recognising that we are better than we know; and for finding a real, meaningful and lasting fulfilment. Deirdre Bounds has written a book that has substance, integrity and real insight. Read it and you may just think it is one of the best investments you ever made in yourself.